Solid Deck Hardwood Dollies are used for Applications including Commercial, Industrial, Distribution, and more. 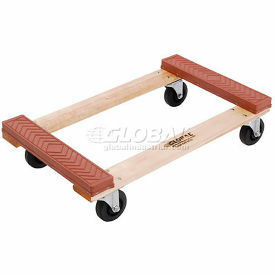 Solid Deck Hardwood Dollies are made of high quality materials for long lasting durability and dependability. Dollies allow ergonomic content mobility and transport. Solid Deck design ensures convenient loading and unloading. Includes four swivel casters for convenient maneuverability and handling. Available Wheel Types are Hard Rubber, Phenolic, and Rubber. Weight capacity ranges from 450 to 1200 lbs. Dimensions vary per model. Open Deck Hardwood Dollies allow Content Mobility and Transport for Commercial, Industrial and Distribution Material Handling Applications. Open Deck Hardwood Dollies are made of solid wood to provide long lasting durability and dependability. Dollies allow ergonomic content mobility and transport. Open Deck design ensures convenient loading and unloading. Includes four swivel casters for convenient maneuverability and handling. Available wheel types are Ebonite, Metal, and Rubber. Weight capacities are 900, 1000 and 1200 lbs. Other dimensions vary per model. Rubber Padded Hardwood Dollies are used for Applications including Commercial, Industrial, Distribution, and more. 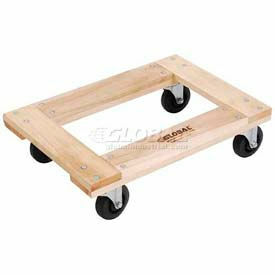 Rubber Padded Hardwood Dollies are made of high quality materials for long lasting durability and dependability. Dollies allow ergonomic content mobility and transport. Padded Rubber cover provides load stability and abrasion resistance. Includes four swivel casters for convenient maneuverability and handling. Types are Rubber Bumpers and Rubber Padded Deck. Weight capacity ranges from 600 to 1200 lbs. Wheel types are Hard Rubber, Plastic, and Rubber. Dimensions vary per model. 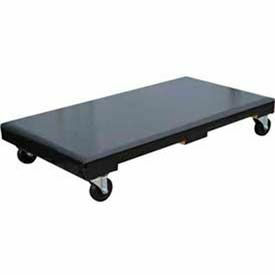 Carpeted Deck Hardwood Dollies are used for Applications including Commercial, Industrial, Distribution, and more. 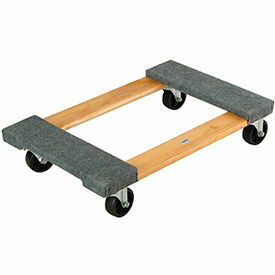 Carpeted Deck Hardwood Dollies are made of high quality materials for long lasting durability and dependability. Dollies allow ergonomic content mobility and transport. Carpeted Deck provides load stability and abrasion resistance. Includes four swivel casters for convenient maneuverability and handling. Available wheel types include Hard Rubber, Polyolefin, and Rubber. Weight capacity ranges from 800 to 1200. Dimensions vary per model. Vestil Hardwood Dolly Panel Converter Bars Convert Wood Dollies into Panel Moving Carts. Vestil Hardwood Dolly Panel Converter Bars are made of steel with black powder coat finish to provide long lasting durability. 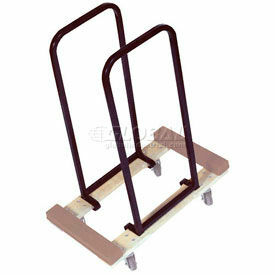 Bars transform an existing Wood Dolly into a Panel Cart by attaching the steel stabilizing arms. 1-5/16" diameter upright arms allow for loads up to 250 lbs. Brackets are press-fit onto the Dolly (maximum dolly thickness is 1-½") and upright size is 12"L x 37"H. Overall height is 39". Units are pre-drilled and ready to attach hardware. Sold in pairs. 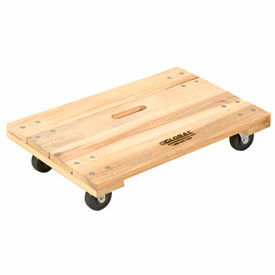 Vestil 6-Wheel Wood Deck Movers Dollies are Oversized for Moving Large Items! Vestil 6-Wheel Wood Deck Movers Dollies feature a 48"L x 24"W hardwood deck that's useful for moving bulky, oversized cargo. Assemble easily. Carpeted Ends Dolly features twin 24" x 12" carpets for added load protection. Open center design with 3-½"W side boards allows for easy carrying. Dolly features a tilt design that allows it to turn on its own radius. Maneuvers easily with (4) 4" swivel end and (2) 5" rigid center non-marking polyurethane casters. Solid Wood Dolly is manufactured from durable ¾" thick plywood construction for carrying smaller packages. Integral hand hole allows for easy portability. 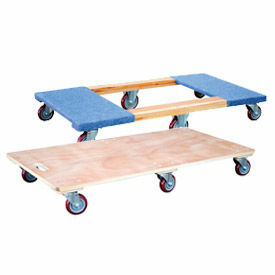 Rolls smoothly with (6) 4" swivel non-marking polyurethane casters. Vestil Vinyl Covered Deck Hardwood Dollies Transport Boxes, Crates and Supplies in various Material Handling Applications. Vestil Vinyl Covered Deck Hardwood Dollies are made of wood with vinyl for long lasting durability and dependability. Vinyl covered deck with foam padding helps protect items during transport. Four swivel hard 3" or 4" rubber casters provide mobility. Assemble easily. Capacities are 900 lbs. and 1,200 lbs..